Professor Mark Warschauer Addresses California State Senate Informational Hearing on Technology Integration in Education "Emerging Technologies and Educational Competitiveness"
The Department has established two school-wide research centers: Center for Research on Cognition and Learning and Center for Research on Out-of-School Time. Faculty grants and contracts for 2010-2011 totaled over $7,800,000. Out of 56 proposals, 44 (79%) were awarded; 81% of Senate faculty have funded research. Professor Mark Warschauer returned from a year sabbatical in Japan and published Learning in the Cloud. 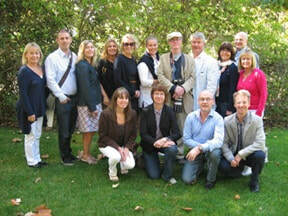 The UC Irvine Ph.D. in Education welcomed 19 new students in Fall 2011, the fifth year of the program. The 2011 application cycle had the largest applicant pool (105), was the most selective (23%), and produced the highest yield (80%). The Teacher Education Integrated Information System (TEIIS), created at UC Irvine to serve as a central repository of records for credential programs, has been implemented at six UC campuses. Professor Awarded 5-Year National Institute of Health Grant: "Human Capital Interventions Across Childhood and Adolescence"
Greg Duncan, Distinguished Professor of Education, has been awarded a five-year grant by the National Institute of Health: "Human Capital Interventions Across Childhood and Adolescence." Over the next five years, Dr. Duncan, three colleagues, and their research teams will explore why human capital-oriented intervention programs and policies, directed at children in the preschool, middle childhood, and adolescent stages of development, have the effects, non-effects, and, in some cases, perverse effects that they do. Professor of Education George Farkas will direct the study of the impacts of early childhood interventions. Christopher (Kitt) Carpenter, Associate Professor and Area Coordinator of Economics and Public Policy in the Paul Merage School of Business will lead the research on state school health curricula. Associate Professor of Economics Mariane Bitler will administer the examination of the distributional impacts of school policies. As Primary Investigator, Professor Duncan will research middle life skills and later life outcomes to determine which achievement, behavior, and attention skills in middle childhood and adolescence are predictive of adult labor market and health outcomes. 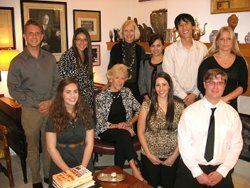 On October 5, Mary Roosevelt hosted a reception at her home in Corona del Mar for the 2011 recipients of the Mary Roosevelt Honor Scholar in Teaching and Learning award. Mary Roosevelt Honor Scholar in Teaching and Learning recipients are teacher credential candidates pursuing their UC Irvine Master of Arts in Teaching degree. They were selected as Mary Roosevelt Honor Scholars because they exemplified a high commitment to improving the lives and opportunities of children and youth through education. During the evening, the candidates were able to explore Mrs. Roosevelt's collection of memorabilia celebrating the lives and contributions of Franklin D. Roosevelt and his son James (Mrs. Roosevelt's husband). Mrs. Roosevelt also shared personal stories from her extraordinary past, including her role in developing the International Baccalaureate degree, her adventures throughout Europe and Africa during the 1960s, and her experiences as a Roosevelt. ​UCI and WestEd Partner for National Science Foundation Research Grant: "Persistence of Teacher Change in Rural Schools: Assessing the Short- and Long-Term Impact of Professional Development on K-2 Science Instruction"
Co-investigators Judith Haymore Sandholtz, Associate Professor of Education, and Cathy Ringstaff, WestEd Senior Research Assistant, have received a National Science Foundation grant to study the short- and long-term impact of professional development on K-2 science instruction. Building on data from a professional development intervention for K-2 teachers in rural California that is nearing its end, UC Irvine and WestEd researchers will examine how long teacher changes resulting from professional development last once the intervention is over; which changes in teacher knowledge, skill, attitude, and instructional practice decay most quickly and which last longer; and which changes appear to be long-term or even permanent. The intervention to be studied, K-2 STARTS: Science & Technology Assistance for Rural Teachers and Small Districts, provided assistance to teachers in 16 rural and small districts with high populations of traditionally underserved students. Goals of the four-year program included increasing teachers’ content and pedagogical content knowledge in science, increasing teachers’ use of research-based strategies in science instruction, improving teacher capacity to use science resources, and increasing networking with other teachers. Will changes resulting from teacher participation in K-2 STARTS be sustained after the professional development activities end? Which changes persist over time, and which changes deteriorate most quickly? Will school and district resources and networks continue to provide adequate instructional support for teachers? The project will compare data collected before and during the four years of the professional development intervention with data to be collected for several years after the intervention ends. The research will be particularly valuable in examining sustainability of teacher change, identifying factors that promote and inhibit long-term changes in instructional practices in K-2 science, and highlighting areas of greatest need for science instruction and teacher professional development in rural settings. Professor Receives Grants from Haynes Foundation and Spencer Foundation to Research "Improving Reading with Digital Scaffolding"
Professor Mark Warschauer has received grants from the Haynes Foundation and the Spencer Foundation to confirm the potential of visual-syntactic text formatting (VSTF) to improve outcomes in Los Angeles region urban schools. The new technology VSTF parses, reformats, and presents digital texts in a cascaded manner that highlights their meaning units and makes them much easier and faster to read, especially by struggling readers or students who are less familiar with English syntax. Preliminary studies suggest that use of VSTF dramatically enhances students' reading comprehension, with the greatest impact on English learners. Though VSTF has been studied before with these promising results, VSTF has not yet been investigated through large-scale naturalistic classroom experiments in urban settings. Professor Warschauer's study will take place in 25 Los Angeles County and Orange County schools in three school districts that, combined, have large numbers of English language learners, Hispanic students, and low-income students; all three districts already provide students laptop computers. For the third year a group of educators from Sweden has spent a day at UC Irvine exchanging perspectives on teacher education and technology with faculty and doctoral students. During their visit on November 1, the Swedish educators from Nacka Municipality (Stockholm region) were greeted by Professor and Chair Deborah Lowe Vandell. Professor Mark Warschauer presented findings from his research on transforming schools with digital media. Kathy Bari, Director of Educational Technology and Information Systems, and Susan Holliday, Executive Director of Educational Technology and Information Services, both from the Capistrano Unified School District, discussed how their district implemented the "Bring Your Own Device" program in K-12 schools. Assistant Professor Elizabeth van Es shared her research on video clubs for teacher professional development. Nineteen new Ph.D. in Education students arrived at Irvine mid-September. The agenda for their DoE Orientation (Monday, September 19) included a welcome by Department Chair Deborah Lowe Vandell and Director of the Ph.D. in Education Mark Warschauer, faculty introductions, Professor Michael E. Martinez's address: "The Nature of Doctoral Work," review of program requirements, a students-only luncheon, specialization and advisor meetings, and a department tour. Tuesday and Wednesday were Teaching Assistant training, hosted by DoE's 2010-2011 Pedagogical Fellows Briana Hinga and Dan Flynn. Six of the new doctoral students have chosen to pursue the Learning, Cognition, and Development specialization; nine are focusing on Educational Policy and Social Context; and four on Language, Literacy, and Technology. Twelve of the incoming class have earned an advanced degree in fields including Anthropology, Child Development, Education, Film & Television, Law, Music, Policy & Management, Psychology, Public Administration, Special Education, and Sociology. 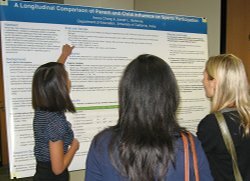 The Department of Education held the 2011 Poster Presentations event on September 23 in the ballroom area of the department. The annual poster presentations showcase the findings from research work conducted by Ph.D. in Education students during their first year in the program. This year thirteen doctoral students entering their second year displayed their posters and explained their research interest, methodology, findings, and implications to faculty, staff, and guests. Seven of the students researched topics in the Learning, Cognition, and Development specialization. Three researched topics in the Educational Policy and Social Context specialization, and two in the Language, Literature, and Technology specialization.